“He’s doing it again, Rich, and customers and employees are irritated with him” said Tina, my department manager. Being the long time retail anchor in downtown Missoula, it was up to us to provide the “official” Santa Clause for the community. Every parent wants to have a picture of their little one with St. Nick. Up until then, I had no problem because I just simply hired the gentleman who had been doing it for the past decade, but this year he was no longer physically able to play the roll. I had to find a new Santa and I hit the jackpot – I thought – when I discovered a professional birthday clown/Santa Clause looking for work! He had experience, could tie balloon animals, and had his own Santa suit! We set up his chair, the camera, and backdrop along a main aisle. We ran an ad in the Missoulain and posted his hours throughout the store. Now I could focus my attention and concentrate on executing the store’s Holiday sales, profit, credit, and customer service strategies. 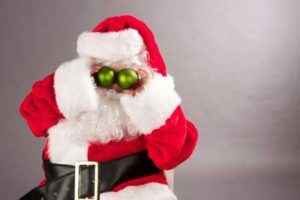 Instead, we quickly discovered our new Santa had a very odd personality – one that my customers and employees found very irritating. Irritating enough to complain and avoid him. He would make a strange comment or crack an awkward joke to everybody who walked by him – nothing inappropriate but strange. It got to the point where my employees would take another longer route in order to avoid having to walk by him when they saw he didn’t have a kid on his lap. I sat down with him in my office, with him in full costume, and had a “fierce conversation” letting him know that I had received complaints and that he needs to concentrate more on being jolly and less on being irritating. He initially resisted but after I gave him several examples of his irritating behavior, he agreed that he would try to do better. This was Santa’s first warning. I noticed an improvement in his behavior but that only lasted two days. He reverted back into his old irritating ways and the complaints started again. I sat down with him again, again with him in full costume, and we had our second “fierce conversation” where I told him that he needs to alter his behavior quickly. He’s driving customers away and irritating my team causing a reduction in their productivity. The critical Christmas season is short and I can’t afford to have Santa hurting my business. This was Santa’s second warning. I had just fired Santa. You gotta do what you gotta do to make things right. This story points out that we occasionally have to do some very uncomfortable disciplinary action on employees or independent contractors. I sure could have avoided dealing with the situation, he was Santa after all. And he was only going to be in the store for a couple more weeks. You have to have the courage to do what’s right. Even if it’s firing Santa. This story goes back to when I was a General Manager for a large department store chain, The Bon Marche (now Macys). It was the Christmas season, the most important time in retail, and my number one producing Department Sales Manager (DSM) requested a day off that fell on the same day as a very important sales event. It was for her six year old son’s birthday. Being a hard driving and competitive store manager who had to obliterate his sales goals, I denied her request and told her she had to work. We had big numbers to make, by god! She dutifully worked that day but her energy and enthusiasm was noticeably less than normal – a condition that continued on for several months afterwards. Looking back, I realized what a hypocrite I was. I had always preached “family first” but denied her the day with her son on his birthday. She always worked hard and effectively every day and was my top performer is sales, credit, and customer service month in and month out. But my short sighted quest to make my sales numbers on one single big sale day ended up costing me so much more. Her morale was dashed and she became disengaged – my number one producing DSM – and I know it cost me more in sales numbers over the long run than what it may have cost me had I let her have the day off. She remained noticeably disengaged and unenthusiastic about her work for several months after. Her performance numbers slipped, affecting the total store’s numbers. Not only that, my credibility was damaged with her and the rest of my store team. I learned a hard lesson about how not to treat a star performer. I certainly should have allowed her to have that one day off and she would have come back an even a stronger and more engaged DSM because I would have shown confidence and trust in her team and her preparation. Several months later, I told my star DSM that I used this story in a presentation I gave a at a store manager meeting. She was a bit embarrassed but I could tell it meant a lot to her that I was willing to publicly share my mistake with my peers. It helped repair our relationship and restore trust. About a year later she returned from a DSM training week in Seattle and told me that the Director of Stores (my bosses boss) shared my story about her and the mistake I made to her entire DSM class. She loved the fact the story had such an impact and was being used to help train the managers in the company about engagement. In my time as a department store General Manager, I found that the Pareto Principle applied in many aspects of my job including my management team. Twenty percent of my management team produced eighty percent of my store’s performance results. My star performer above was in that twenty percent and by showing insensitivity and a lack of trust in her, I damaged a certain level of her ability to produce the eighty percent of the performance results that she normally achieved. I should have allowed my Star to have the one day off to celebrate her son’t sixth birthday. I should have trusted her preparation and her team to make her goals for the day without her being there. I seriously goofed. And it cost me. I read a post over at TLNT a while back that reminded me of my experience with my previous career at Macy’s (formally The Bon Marche). It’s about workplace loyalty and how it can work in the job market today. If you’re an employee and believe that your loyalty will be remembered by your employer when it’s time for the tough decisions, my question to you is, “why on earth would you place your career decisions entirely in the hands of someone else?” Not only will working at one place for too long make you stale, you’re giving up the control of managing your own career. What if your manager retires, transfers or gets a new gig outside of the company? So much for all of those years of loyalty. Do you think your manager is going to present a succession plan for you on their way out the door? Avoid being naive and recognize the excess of “dog eat dog” attitudes in Corporate America. I spent 22 years working for The Bon Marche’/Macy’s. Twenty of those years for The Bon Marche’ which was reorganized and converted to Macy’s where I remained for two years. I worked my way steadily up the ranks during my twenty years at The Bon Marche’ where there was a core group of executive and regional management who I knew well and who knew me and what I was capable of accomplishing. We had a long and positive professional history that I was proud to have developed and count on when it came to my performance and career decisions. When the company reorganized and converted to Macy’s, they closed the Seattle corporate office and laid off all the executive management. They also restructured the regions and brought in “new blood” and expanded the regional management staff. My entire 20 year history of accomplishments, skills, and knowledge was immediately wiped out and meant nothing to the newly reorganized company. Rather than being relied on and trusted to run and operate my store as I was trained to do – and was very good at – I was being told how to run my store by group of people who never ran a store. I gave it my best but eventually realized I was no longer a good fit in the reorganized company. I was miserable and dreaded going to work every day. My experience, knowledge, skills, abilities, and creativity were no longer valued or even considered. I had to leave and move on. I made the mistake of thinking my work history, accomplishments, and loyalty to the company would benefit and help my continued career with newly organized Macy’s. It didn’t. So, I left and took my KSA’s to Denver and am loving my current job as Director of HR, IR/PR at a uranium mining company. I learned a valuable life lesson. You need to have complete control over your career. It is your responsibility, not your employer’s. Network in your profession and in your industry. Network outside of your profession and industry. Develop relationships with recruiters. Grow your knowledge in your profession and industry. Periodically look at job openings to see what is out there and what they are paying. You’re not being disloyal to your company, you are being responsible and taking control of yourself, your family, and your career. Do you think your loyalty will be reciprocated when your company is facing tough times and has to review numbers and headcount for a reduction in force? What is a manager’s most important responsibility? It’s quite simple, actually. The most important responsibility of any manager is to hire the best people they can. What happens to everybody’s workload when a manager makes a good hire? We love it!! A good hire makes everybody more productive by allowing them to continue their work while being competent enough to do their own. A good hire is somebody who others enjoy working with creating a positive work environment which increases morale and production. It’s motivating when the new hire fits in well and effectively contributes. What happens to everybody’s workload when a manager makes a bad hire? We hate it!! A bad hire creates more work for everybody as they compensate for the poor performer. A bad hire can also create a poisoned work environment leading to poor morale and reducing overall production. A bad hire can make good employees flee the organization if nothing appropriate is done to remedy the situation. We’ve all made bad, if not horrible, hiring decisions in our career. I certainly have and have paid the price. As an HR leader, it’s vital that we train and coach managers on how to effectively recruit, interview, hire, develop, and retain great employees. So many managers “shoot from the hip” when it comes to these critical steps. Sure they get it right sometimes and justify their methods by focusing on when they did well. If they were honest with themselves, however, they would say they got it wrong more than they got it right. With the huge impact a good or bad hire can have on an organization a manager’s most important responsibility is to hire the best people they can.